It has been 1 year! 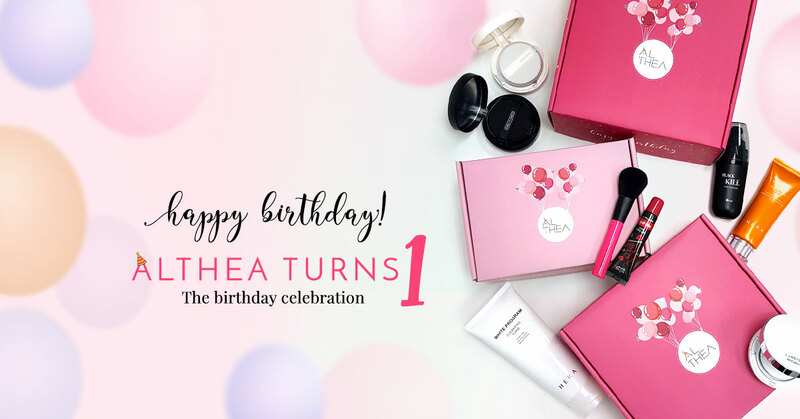 Althea now celebrate it's first birthday! Woot Woot! If you don't know what is Althea, let me break it down to you. Althea is an online store where you can get Korean beauty products wayyyy affordable and it is directly ship from Korea to your doorstep. You will have the best K-Beauty shopping experience where also your purchase will come in a pink box! Also it has a Free Shipping offer all year round to Malaysia. How cool is that! All of the products they carry are 100% authentic and worry free as they have a unconditional return within 30 days. So Althea is celebrating it 1st birthday with a BLAST! Shop from 20th - 31st July, 2016 and you will get their Limited Edition Birthday Box + DIY Party Kit (While stock last). Along the way, you entitle for their Giveaway where 3 lucky customer will get 100% rebate of their purchases! Macbook Air, Ipad Air 2, iPhone 6S, Galaxy S6 Edge, Canon EOS M10 Selfie Camera, Althea credits and beauty hampers from Althea! Are you one of their early customer that receive the Limited Edition Party Kit? *Terms and conditions apply. More info go to www.althea.kr and Althea Facebook for more information. 3 million views! Woohooo! Congrats Sabrina!